The data of the Czech Statistical Office includes, apart from hotels, also other types of accommodation facilities, revealing that the Czech metropolis offered overall accommodation capacity of 41,617 rooms with 90,891 beds in a total of 787 accommodation facilities in 2017. Along with an average hotel occupancy of 80% in 2017, Prague is ranked 5th among markets with the highest occupancy in Europe ***. Vienna continues to be the second largest market in the region, attracting over 15.5 million overnight stays in 2017 and taking 13th place in terms of occupancy levels. The third biggest hotel market in the CE region is Budapest which occupies 10th place on the highest occupancy ranking list. 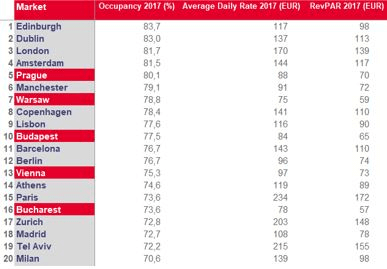 The overal occupancy levels in the key hotel markets across Central Europe have reached very robust levels, leaving behind several major tourism destinations such as Madrid, Milan or Rome. “The rising demand trend is expected to continue, although some cities are likely to experience a milder growth in the following years, as they become more expensive and/or reach the full capacity during the peak season. Nevertheless, the growing trend is anticipated to continue, driven by new demand sources, particularly from Asia and Middle East,” says Bořivoj Vokřínek, Partner, Strategic Advisory & Head of Hospitality Research EMEA at Cushman & Wakefield. Investment demand hit a record high in 2017, totalling EUR 1.7 billion with 67 transactions as opposed to 1.3 billion in 2016 with 56 transactions recorded in core CEE hotel investment markets. The highest volume of transactions was again seen in Austria, in total EUR 791 million. The second most active was Poland with 15 transactions worth EUR 402 million in total. The Czech Republic had a very good year with over EUR 235 million being transacted in the hotel industry in 2017, only a slight drop from the previous record-breaking year when the total volume of transactions was 292 million euro. There are more than 13,000 rooms that are expected to be added to the capital cities of the CEE region within the next three years, in the categories ranging from midscale to luxury. In Prague, for example, the W Prague hotel should be opened by 2020, a new hotel is also planned to be built near the growing congress and cultural centre of O2 universum. In the coming years, a five-star hotel is planned to be built in Senovážné náměstí. The Ritz-Carlton Hotel project in close proximity of the Old Town Square, which could be opened by 2022, is under consideration. By the year 2021, the Hotel Letná with the capacity of nearly 500 rooms for a thousand guests and a congress centre is another construction project that is under consideration. In 2017, according to the Czech Statistical Office, 4,127 conferences were held in the capital of the Czech Republic, representing a third of all the events that took place in the Czech Republic. More than half a million delegates participated in the Prague conferences. The Prague Convention Bureau statistics, based on data collected from its member entities, show that Prague, in the long run, has had a stable ratio of international (49.2%) and local events (50.8%). In 2017, meeting delegates from abroad arrived to Prague most frequently from the USA, Great Britain, Germany, Switzerland and France. *** Based on the reported performance data for 35 key hotel markets as published in the European Hotel Review by STR.